Demoiselle Crane (કરકરો) is the one of beautiful bird with beautiful mascara. The Demoiselle Crane (Anthropoides virgo) is a species of crane found in central Eurasia, ranging from the Black Sea to Mongolia and North Eastern China. The birds from Asia, Mongolia and China will spend the winter in the Indian subcontinent. In Gujarat we saw them at many places but the most promising place for them in Vadla dam site situated near the Nal Sarovar Bird Sanctuary. Demoiselle Cranes gather here in large number. While returned to Patan from Ahmedabad we visited this place. 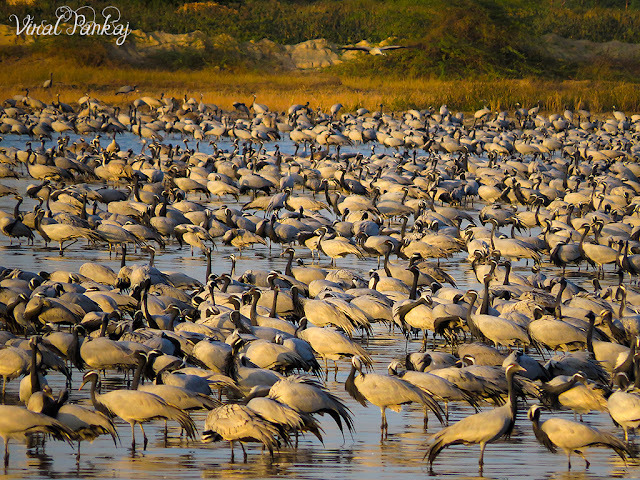 Demoiselle Cranes are roosting at Vadla wetland in this season. It was evening time so all the birds from surroundings are gather here. We stayed almost two hours and during this time more n more Demoiselle Crane are kept coming along with Common Crane, Pelicans, Common Coot, Greylag Geese etc. 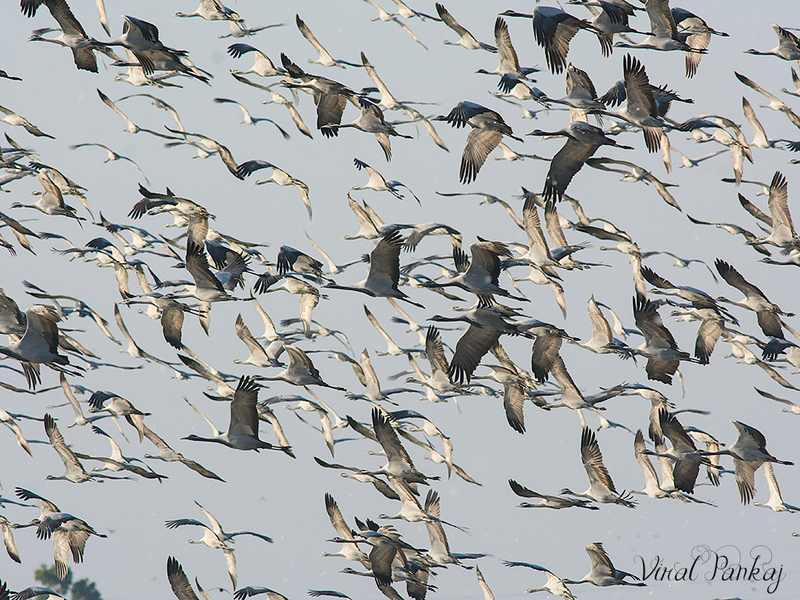 Soon wetland is flooded with thousands of Demoiselle Cranes, it’s an amazing site. They are busy in calling, preening, foraging and practising display. Whole area is pulsated alive with their evening chorus. We also registered presence of some raptors like GSE, Marsh Harrier and Black-shouldered Kite. When any raptor fly over Demoiselle Cranes, they started to make shrill alarm calls and take a roundabout short flight before landing back in the lake. They are looking so beautiful… especially their red eyes lined with white mascara. They are so many…It was difficult for us to click all the birds in single frame. We take some great shots in stunning evening light. 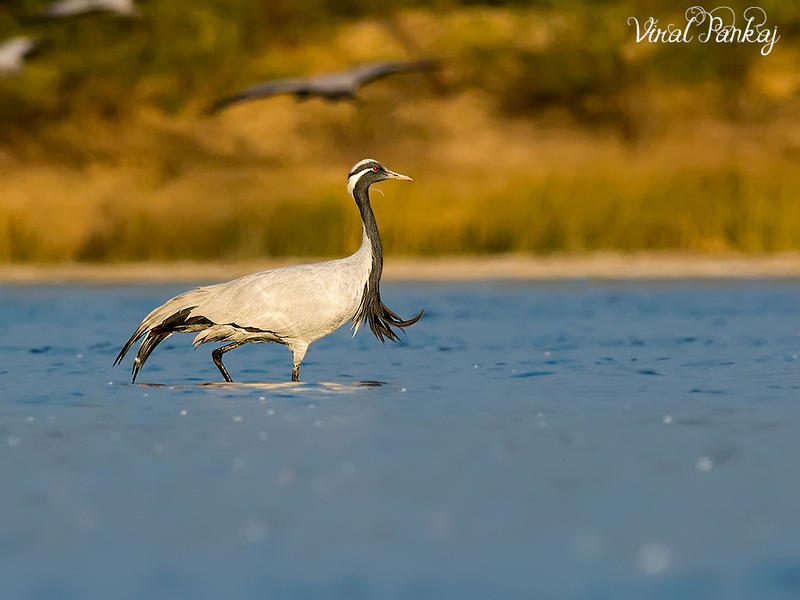 Still more Demoiselle Cranes were kept coming to wetland when we were finally leaving the place. We can able to hear their communal song at quite far distance. Its our ‘Demoiselle Crane Day ’.